Cover your ears! Whenever the Tanaka Racing C5R edition Corvette Z06 passes by me on the track, I can actually feel the exhaust note pounding against my chest. As it passes by me, I can sometimes feel the heat from the exhaust gases on my cheek, as tiny rubber particles sprinkle down on me, sticking to my head, my forearms, and all over my clothing – it makes me feel as if I’m being seasoned with salt and pepper or something. 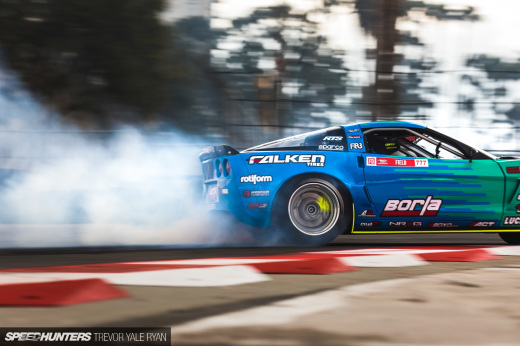 Driven by Conrad Grunewald, a driving instructor from Monterey California (and former driver of the Motorsport Dynamics S14 240SX), the Tanaka Corvette Z06 definitely gets a lot of attention at the track. Even if you’re not necessarily a Corvette fan, this 2003 C5R commands attention from you, with the deafening roar of its engine being pushed to its RPM limit as Conrad skilfully manhandles the beast around the course. 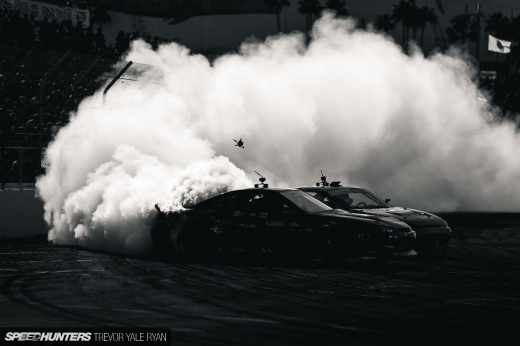 This Corvette spews out ridiculous amounts of thick white tire smoke from the rear wheels, and is easily one of the loudest cars in the Formula D Championship. It also looks every bit as aggressive as it sounds – with its big cowl hood and aggressive aero pieces, this isn’t your normal Sunday driver Corvette. Inside the cockpit, the Tanaka Racing team has fitted the car with a host of Autometer gauges and standard safety equipment, like a 350mm steering wheel, racing bucket seats, 3-inch wide racing harnesses, and a custom roll cage with door beams to protect against a side impact. Let’s focus in on the rear of the car for a moment. A GT wing has been added to the rear of the car for downforce, and a bright orange towstrap is sticking out of the rear bodywork to make it easier to tow the car off the track. The big Technosquare logo on the rear of the car lets us know the ECU and chassis development is top notch – Howard and Richie Watanabe from Technosquare in Torrance, California are top notch tuners who have extensive experience in circuit and rally racing… and as an interesting side note, they were an integral part of the development team at Toyota Racing Development when the AE86 was still a new car. 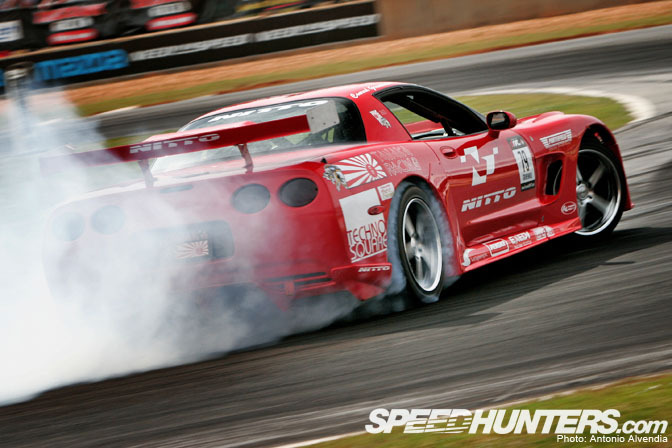 In case you’re wondering what tires are being incinerated in the photo, those are (were) Nitto Invo 295/35/ZR18 tires. Yup, that’s right. I said 295!!! Here’s a zoomed out view so you can see the whole shot! Here’s what most people were waiting for – the engine info! The engine used in this Corvette is a 427 cubic inch Chevrolet LS6 engine, with a Magnacharger supercharger. The team is only running 2 lbs of boost, so the supercharger should be pretty reliable, even with Conrad beating the car up at the track. This combo makes 650 horsepower to the wheels, with 545 lbs of torque. 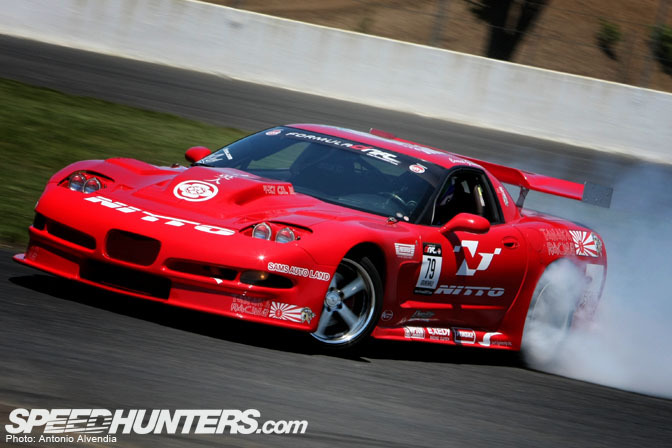 No wonder this C5R seems to smoke tires so easily! This photo gives us a look at the front suspension. I was impressed to find out that the Tanaka Racing Corvette is running high end racing coilover suspension – Penske 8700 Series adjustable coilovers to be exact. This isn’t your standard run of the mill Tein or JIC stuff you normally find on import cars! 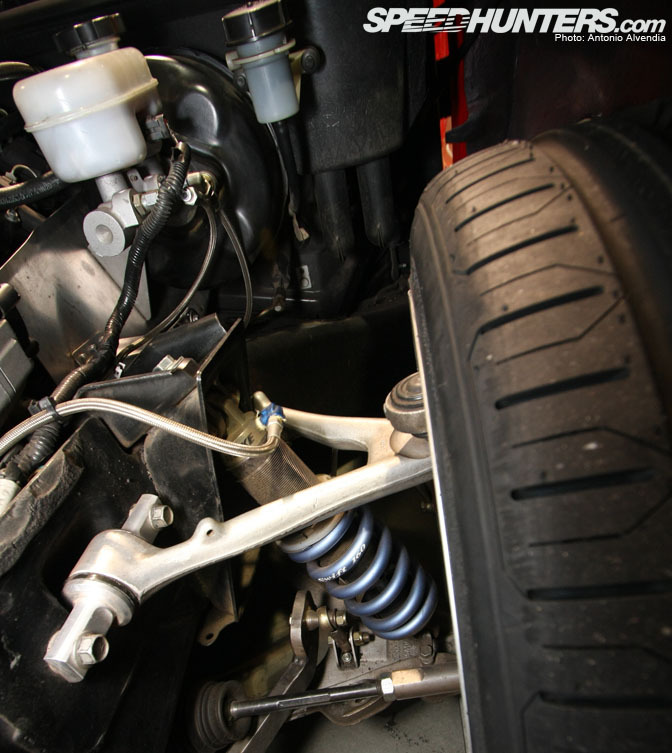 I also thought it was interesting that they were running Japanese coil springs from Swift Engineering, which seem to be extremely popular for drivers in the D1 series because of their consistency in spring rates and ability to make custom springs for many applications. The huge front tire you can’t help but stare at is a Nitto Invo 235/35/ZR18. I’ll be honest here. I’m not the hugest fan of the wheel design on this Corvette – I think it would look cooler with some mesh wheels or some multiple spoke wheels. However, the wheels chosen for the car are Maya RT5 wheels, and check out the sizes! 18×9.5 (+32 offset) up front and 18×10.5 (+53 offset) in the rear. Wow! +53 offset!!! 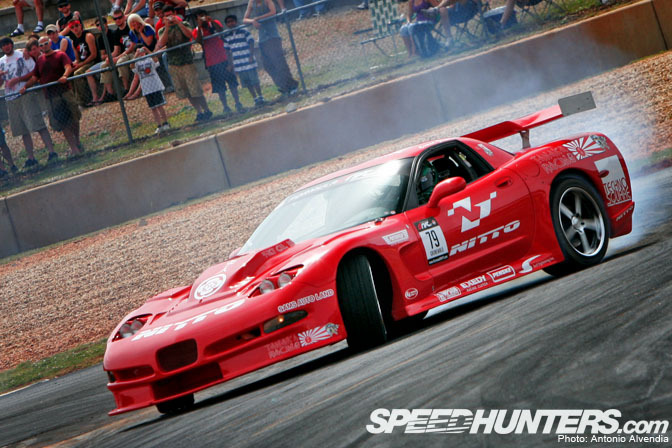 No matter what, there is no denying the Tanaka Racing C5R’s presence on the track at Formula D events. It’s one of those cars that screams for your attention – literally, because as it passes by you, you will feel the earth shake underneath your feet, and your ears will just about pop from the loud powerful roar of the engine… and with a driver like Conrad Grunewald behind the wheel, I’m sure this car is destined to attain top rankings in the Formula D series! Keep an eye out for it! And remember… cover your ears. Sorry guys....But.....I don't doubt that this car was built great but.....As far as looks goes....It reminds me of someone that went crazy with their J.C Whitney credit card This car would be the shizzle if it where 1992 and the sound system was bumpin' Ugly kid joe. Sorry..just my take. On a positive note..Awesome article and pics Antonio! I have to agree with Johnathan. This Corvette is just 'blah' to me. I can't believe you Antonio, among all the SP writers, you picked this Corvette from the bunch. YOU, that offset is everything....c'mon ! The wheels are wack, the offset worse, the rear wing is aluminium.....which reminds me APC cheap product, the body kit is overly bulky and cheap looking. Then you see Penske coilovers with Swift spring, and Techno Square which probably weld that state-of-the-art roll cage.....and you ask yourself why. This Vette, all it has is power and a load exhaust, driven by a more-than capable peep. I read on another post here that this car is styled after the C5R but I dotn see it. If they could run the same C5R hood and paint the rear end black I think it would be a step in the right direction. I just watched that thing race from a few feet away (photo pass) at Irwindale. That car is insane, I like corvettes and I really hate the hood bulge, but there is no way not to be impressed by this car when it lights up at point blank range. You can feel the engine. I do agree that the rims are not the best for the shape.